And the winner of the Dream Horse Challenge is… the Frederiksborg horse (also called the Frederiksborger). Thank you to Rachel Danielle, who nominated the breed. The Frederiksborg horse is a heavy, elegant horse from Denmark. They are always chestnut in color, normally with white markings. Their crested necks are topped by a clearly defined head, slightly convex. the shoulders are strong and sloping, giving the horse smooth gaits. 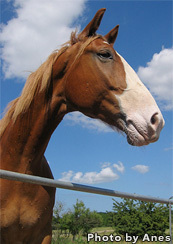 The horse was very popular in the Renaissance period, although it is almost extinct today. They are showy horses who have smooth gaits, the best of which is their trot. The breed was first recognized by King Frederik II. The Frederiksborg horse has Arab and Iberian blood in it, which attributes to their grace. Wow. This is a great blog ,and I learned alot from it. You proved like 3 things here: 1. U r a great writer, 2. Learning new things can be fun and 3. Longer is not always better. Like sometimes when I read a really really long story with a million facts my head feels like it’s going to explode. U have a very nice length here, and you wrote this just right. Very cool, Jeanna Briggs! Congrats to the Frederiksborg!